It seems like just about every app on my Mac wants Internet access today, and sometimes I want more control over which apps have that instant access. Radio Silence is just the tool for the job. It’s a powerful yet easy to use firewall that lets users block applications from accessing the Internet. It is perhaps the easiest firewall I’ve ever used. 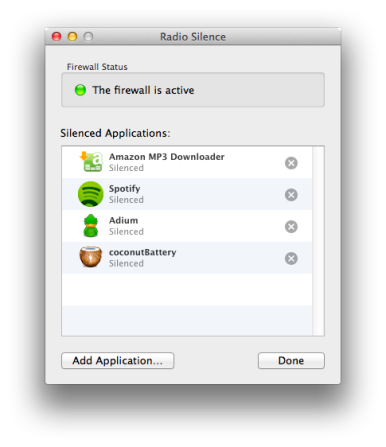 To silence, or block, an app like Spotify, for example, I opened Radio Silence and chose Spotify from my applications folder. That was the entire process. I then loaded Spotify and confirmed that Spotify was unable to access the Internet. Radio Silence runs automatically when you start your Mac, so the only time you need to actually open its window is when you want to silence or un-silence specific apps. Apps are silenced as soon as they’re added to Radio Silence, which continues to block those programs until you remove them from the list. Although Mac OS X contains a built-in firewall, this firewall doesn’t actually block outgoing connections. Radio Silence blocks outgoing connections only, so the two firewalls complement each other well. With its one click, set it and forget it firewall management, Radio Silence is a useful utility that makes a welcome addition to any Mac.